Thanks for visiting The Haven online! Since being established in 1969, The Haven has been a family-owned business - we believe that fact has helped us provide our Northwoods customers the perfect blend of great food in a warm and friendly atmosphere. Whether it's a casual dinner for the family or a festive celebration, The Haven has been delivering satisfaction for decades. Our Italian and American cuisines are favorites though it's likely our specialty - Pizza - that brings the most joy to our customer's taste buds. 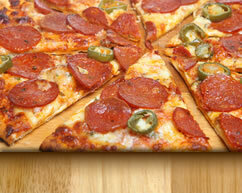 From personal-size pizzas to huge party pizzas, we offer the best made-from-scratch pizzas in the Northwoods! Once you try The Haven's pizza, we know you'll love it! Our Banquet and Party facilities, which are some of the finest in the area, are in high demand for weddings, birthday, office, & anniversary parties, and business meetings. With a seating capacity of up to 225, we can handle even your biggest reception. We offer a complete Banquet Menu and even Specialty Cakes to make your next get-together perfect. Join us anytime for Dinner and enjoy our pool table and game room or plan your next big party at The Haven and let us do all the work. Check out our Daily & Weekly Specials. There's always something cooking at The Haven. We're glad that you stopped to see us online - we look forward to serving you!